On other stackexchange sites, when an unregistered user logs in we can enter a name and password into an Open ID page, and once that is accepted we are taken to the front page for that stackexchange site. But on MO, after entering an Open ID name and password there is an additional page that pops up saying MO wants to view the Open ID information (at least if your Open ID is a gmail account), with a choice to Accept or Cancel. Why does MO have this last step, which other stackexchange sites I've used do not? Extra question: when I give a tag on this question I chose "registration", but then I am told that I must use one of the 4 tags bug, feature-request, discussion, or support. Why is one of these four tags mandatory? Next to the header "Connected applications and sites", click the link labeled "Review permissions". You'll be asked to confirm your password. 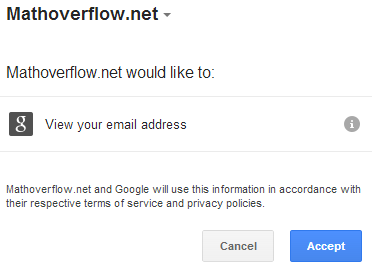 Verify that mathoverflow.net is in that list. If it's not, something else is wrong. If it is, then click the "Revoke Access" button - you'll see a message indicating that this has been done. Clicking Accept here will re-add mathoverflow.net to your list of authorized apps/sites - hopefully now with the correct permissions. (bonus step) Log out and try logging in again - you shouldn't see the prompt from Step #7 this time. The behavior is the same on all sites. The difference is that when you log in to a particular site using a particular OpenID for the first time, most OpenID providers ask for verification1. So, while you may be used to logging into tex.SE without being asked for confirmation, the first time you log in to MO with the same credentials, you will be asked. Next time you log in (unless you use a different associated OpenID), this step will no longer trouble you. Regarding the four meta tags, this is because all meta posts fall into at least one of those four categories. In this case it's support. Usually, discussion is a catch-all tag and always works whenever you're not sure. Added note: this is not what is actually happening (see comment of Shog9), I leave this up since some of the general information could be of (limited) interest to some. I decided to record some thoughts and pieces of information to complement and summarize already provided information by others, trying to focus specifically on the problem KConrad (and likely some others) encounter [I always say KConrad as while this might read slightly strange it seems better readable than to say "some user wit this or that additional property relative to the system"]. I am not sure if all I say is fully correct [added: turns out it is not], but after some thought this scenario seems reasonable and compatible with all reported and observed behavior. (I also wrote something like this on "tea" but thought I repost it here for visibility). My main reference is the following (official) blog post on OpenID on the network previosuly mentioned in my comment. That’s a major bummer for site networks like us with multiple domains. We use the OpenID string as your user "fingerprint", so if your "fingerprint" changes, we can’t tell who you are any more. It’s a frustrating problem, but we think we’ve finally come up with a fix: we demand email from Google GMail OpenIDs! So, SE has typically two identifying pieces of information for a user (using Google OpenID). One OpenID string, generated for some of their domainnames (likely the first ever used) and the associated email address (to get this they need to ask permission, which is the step discussed here). This email is then stored. I assume KConrad's "fingerprint" (see the quote above) is his OpenID string for stackexchange.com. This OpenID string is likely the same over all the others sites except MO he uses, as all seem to be [something].stackexchange.com (yet not stackoverflow.com for example), so the domainname is the same and Google gives out the same string. Likely, permission was granted SE once, and now long ago, to retrive the email address when he started using the network. Thus, when he logs in to one of the stackexchange.com sites the system recognizes the OpenID string Google gives (the one for SE.com) as his "fingerprint" and thus has no need for the email address. If however, he logs in to MO, then Google gives his OpenID string for MO.net, which is different. Thus, this is not his "fingerprint" and the system does not recognize him. And, thus, needs to ask for the second piece of indentifying information the email-address. The reason that this was a non-issue on the old MO is that there was only one domainname at all, and thus the OpenID string was always suffcient. The reason that this does not happen to everybody using Google OpenID for MO now, is that for some (in particular those not having had an account on the network before) their "fingerprint" is the OpenID for MO.net. Likely, they have the dual problem, being asked on each stackexchange.com site (as reported by Scott Morrison). Possibly a solution: (This is only a rephrasing of my understanding of what Manishearth said already.) It seems to be possible to add more than one OpenID string to an account, i.e., to have more than one "fingerprint" recognized by the system. So, via adding the OpenID string for MO.net as additional fingerprint to the account, KConrad might be able to avoid having to grant permission each time. Why aren't the Precognitive and Beta badges retired?